INDIANAPOLIS - Acting with uncommon speed, NCAA president Mark Emmert Thursday said he urged Indiana governor Mike Pence, state legislative leaders and local business leaders to revise the controversial Religious Freedom Restoration Act to prevent acts of discrimination that create an environment "within which college athletics would find it very difficult to operate." Reacting to pressure from the NCAA, which is headquartered in Indianapolis and has a major economic impact on the city, the Indiana Senate and House each passed changes to the law Thursday afternoon that ostensibly would make it clear the law cannot be used to discriminate based on sexual orientation and gender identity. The measure was signed by the governor. 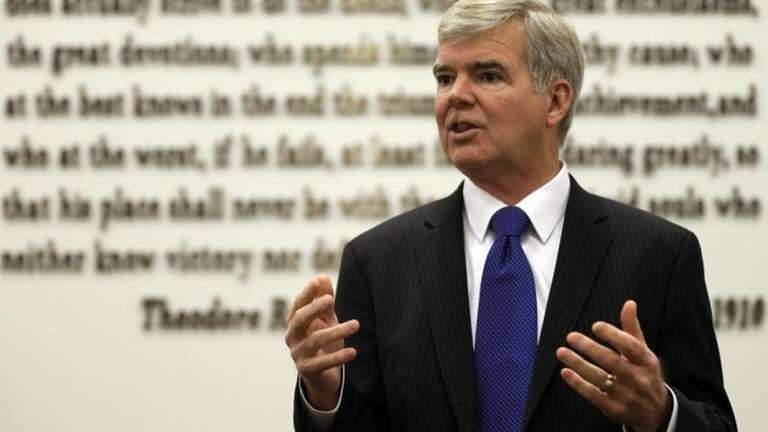 "We made very clear that we wanted this bill resolved as quickly as possible," Emmert said at a news conference held in conjunction with the Final Four basketball championship. "This bill is more important than a basketball tournament." Kansas State University president Kirk Schulz, who chairs the NCAA Board of Governors, said the organization acted quickly to avoid the appearance of being afraid to take a public stand during its marquee event. Emmert acknowledged NCAA competitions across the country might be affected by laws similar in nature to Indiana's RFRA. But there was a special urgency to act in the state where the NCAA is headquartered and often holds major competitions. According to the most recent NCAA figures, the organization generated $161.8 million in economic activity locally in 2012 when there was no Final Four. Visit Indy estimates the Final Four alone will produce $70 million in direct spending. Pressed on whether the NCAA might move if its concerns weren't resolved, Emmert said he and the Board of Governors might be forced to act. "Let's be clear, Indiana and Indianapolis has been a really great host for the NCAA," Emmert said. "People love being in this city . . . [But] if I believed we couldn't conduct our affairs in any place in a fashion that didn't prohibit discrimination against people for any number of reasons, then I would surely recommend that we move. I hope we don't find ourselves in that place." Emmert and the NCAA now must determine if the revisions are sufficient. Opposition from the LGBT community and other groups might not abate until the law is repealed or the legislature adds sexual orientation and gender identity as a protected class.